The Conclusion of Carlos Taibo’s Rethinking Anarchy: Direct Action, Self-Management, Autonomy (La Catarata, Madrid, 2013) brings to an end, after trials and tribulations, the translation of this work, through which we have sought to share with English readers the work of one of the most significant anarchist voices today in spain. This exercise was motivated by the importance of Taibo’s work in spain, and whatever differences we may have with his views, we believe that the work more than merited our efforts. The translations of the earlier chapters have already been published on Autonomies. Another characteristic that has already called my attention on more than one occasion in this text: in my understanding, the libertarian world should persist obstinately with the firm goal of avoiding calls for purity and self-centred group realities, in benefit of working with common people. It would be terribly problematic if the discourse of contemporary anarchism were reduced to that of a closed identitarian group: it should instead always open itself onto popular struggles, immersed in the great flows of contestation and emancipation, in a free dialogue with other currents. Holloway has emphasised that it is not a matter of everyone being a radical anti-capitalist: what happens is that the experience of capitalist oppression generates in many people the beginning of a rejection and rebellion that should be stimulated. (2) There is not then the artificial creation of consciousness, nor a guiding from outside, but rather an operation of recovery of something that is already there. No revolution can be carried out – as Lenin pretends – in the name of others. For Lenin, the workers are by themselves incapable of transcending the superficial world of labour union consciousness, for which reason it is necessary to push their consciousness from outside, by those who possess a social science that provides certainties, that is, in fact, by those who belong to the educated higher classes. “Scientific socialism is the theory of the emancipation of the proletariat, but certainly not the self-emancipation of the proletariat.” (Holloway)(3) Within this horizon, a separation arises between a them – the proletariat – and an us – the people who, fully conscious, should take power in the name of others. The above does not mean that we should close our eyes and mouths before unedifying realities. We must of course be suspicious of a light and easy anarchism, ignorant of self-management and direct action. An anarchism of appearances and external signs does exist, very radical in expression, but often detached from any transformative practice. If this anarchism deserves to be roundly criticised, it would not thereby be appropriate that we should therefore consider the older hardened and organic militancy to be without blemish. For this last – to state matters fully, and if one has to choose – to demand the maximum is more useful than the possible, the latter seemingly overtaking almost everything. Even with it, one should keep one’s distance with respect to those dogmatic and pure anarchists who never dirty their hands. “Sitting, waiting for the revolution, the chair, my boss loaned it to me”, goes a song by Sérgio Godinho. It is very easy to write radical indictments against the State and no less radical defences of libertarian communism without feeling the obligation to think through what we should and what we can do now. And this is so because the perception of complex situations is inevitably different for those who struggle within them, from those who limit themselves to reflection. If to what I have just summarised is added a very delicate phenomenon – the haughty disdain of those assumed ignorant or inept –, the circle closes dangerously. This is singularly the case when the protagonists of such conduct display a special, and pathological, interest in seeking out enemies in the very libertarian world, as if they sought to give shape to a space from which all competitors should completely disappear. It is painfully surprising that many who take on this behaviour reproduce all of the habits of the foolish and irrelevant (zorrocotroco) world that gestated such a long time ago in the traditional left. The drivel about revealed truths and exultant working classes is therefore equal to that announced with great assurance by Leninist, Trotskyist and Stalinist sects, from the hand of organisations and personalities with a facade of activism and with no reality behind it. When the exercise does not convert itself into a theatre of appearances, paradoxically useful to power, radicalism always deserves credit. And we are familiar enough with those who have dogmatically defended anarchist purity, who then, finally, walked off towards other horizons; because, in the end, it is very difficult to be pure for any length of time. Holloway, op. cit., p. 226. Quoted in Guérin, op. cit., p. 12. Emma Goldman, “A Life Worth Living”, in Robert Graham ed. 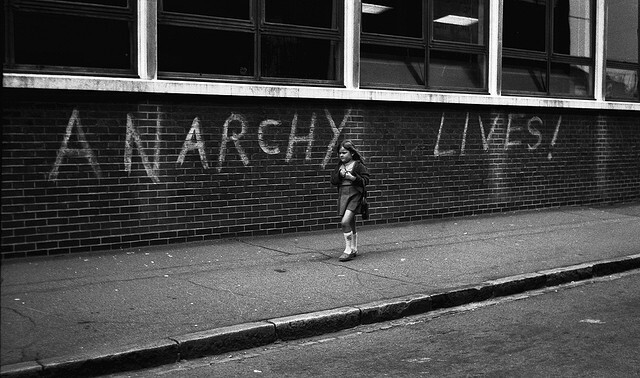 Anarchism. A Documentary History of Libertarian Ideas. Volume 1. From Anarchy to Anarchism (300 CE to 1939). Black Rose, Montreal/New York/London, 2005, p. 496.